The town along the road to Ravenna and the seaside. The power and the wealth. 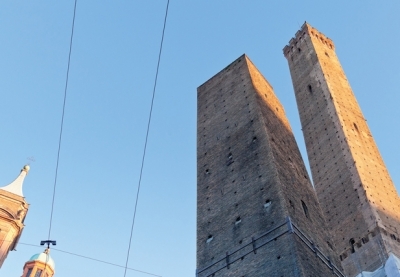 The Due Torri are one of the symbols of Bologna and also the landmark that stood out against the sky for those who came from Ravenna and via Emilia from the south. piazza di Porta Ravegnana with its towers, was the point of arrival and of departure for the connections with Ravenna, that in the late imperial period was already a town of great importance and later became the capital of the byzantine government in Italy. This area was the door of communication for the trade towards the sea and for the political relationships at the highest level: at first with the Empire later with the Pope. The Due Torri have stood out against the sky for almost nine hundred years: they were already built in stone at the beginning of the 12th century. 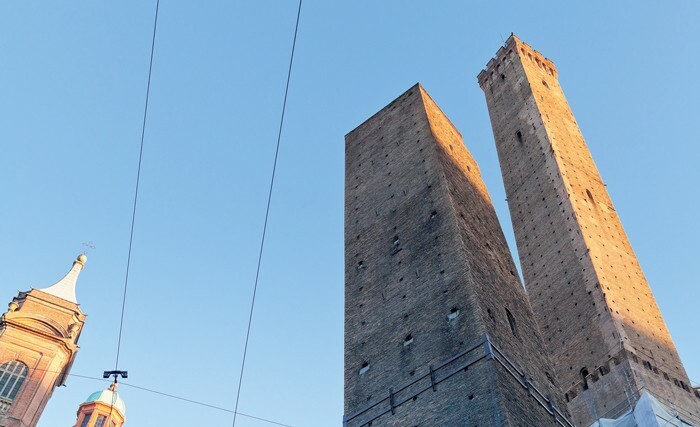 Their names come from the families that built them: the torre Asinelli, 97,2 meters high, had few rivals for its dimension at that time. The leaning originates a drop of 2,23 meters and the top is reachable through the stairs of 498 steps that lead to the small terrace in order to enjoy a very enchanting view of the town, as Goethe did when he stopped in Bologna during his journey to Italy. The torre Garisenda soon after its construction leaned so much that its building was interrupted and in the 14th century about 12 meters were demolished, reaching the height of about 48 meters. Dante Alighieri saw it when it was still intact and he compared it to the giant Anteo bent over him and Virgilio in the XXXI canto of the Hell. The drop of the leaning is of about 3,4 meters opposed to the basis. Together with the Due Torri there is the statue of San Petronio, patron Saint of Bologna. From the square it is possible to see the two doors that lead to the seaside: via San Vitale and strada Maggiore. At about halfway of via San Vitale on the corner with piazza Aldovrandi, you can see the Torresotto di San Vitale, an old entrance door inside the town wall built at the half of the 12th century and later they were substituted by a wider wall at the beginning of the 16th century. Near the Torresotto at n. 50 there is the chiesa dei Santi Vitale e Agricola, according to the tradition built on the remains of the roman arena in which the above mentioned saints were martyred. In the 16th century it was rebuilt by the benedictine nuns and shows works of art of great value like the renaissance cappella di Santa Maria degli Angeli and a crypt of the original church. On the left of the entrance, in the wall, there is the grave with the shrine of Liuzzo De Liuzzi and his grandson Mondino De Liuzzi, physicians and lecturers of the bolognese Studio (ancient name of the university) that died at the beginning of the 14th century. On the opposite side of the church, not very far there is Palazzo Fantuzzi, with its 1521 façade, very particular for its bossage semi columns and the decorations with elephants, allusion to the coat of arms of the Fantuzzi family. Along strada Maggiore there is the chiesa dei Santi Bartolomeo e Gaetano, under the Due Torri: it is among the oldest churches in Bologna rebuilt in 1516 by Andrea da Formigine with its beautiful portico with decorated columns. It was rebuilt again later, inside there are works by Ludovico Carracci, Guido Reni and other masters of the bolognese 17th century. 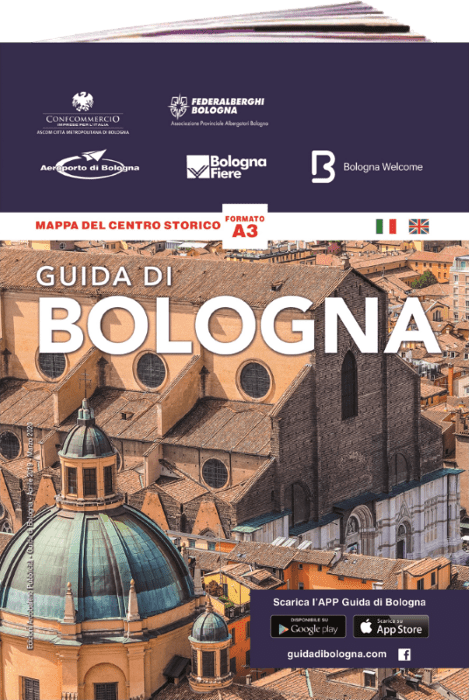 At few steps from the church you can see an example of bolognese buildings with porticos that date back to the 13th century with Casa Isolani at n.19. The very high oak beams of the portico (9 meters) bear the third floor of the palace giving a slender aspect to the façade. 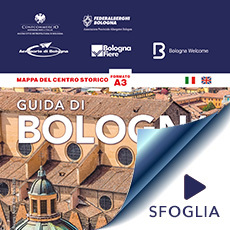 From here there is also Corte Isolani, an interesting route among the small courts that connect Casa Isolani to strada Maggiore with Palazzo Isolani in via Santo Stefano, where there is the Basilica di Santo Stefano. Museo Internazionale and Biblioteca della Musica, in the rooms of Palazzo Sanguinetti, where precious collections of musical instruments, paintings and also volumes integrate those of the library of the conservatory in piazza Rossini. In the nearby via Guerrazzi at the n. 13 there is Palazzo Carrati where, since 1666, there is the seat of the Accademia Filarmonica di Bologna. It’s a famous and important institution in Europe as Mozart and other famous musicians studied there. There is still music on the corner between via Guerrazzi and strada Maggiore, where you can find the portico with marble columns of the Basilica di Santa Maria dei Servi that delimitates the churchyard with the beautiful gothic façade. Built at the end of the 14th century with three naves, the church holds many works of art among which the Madonna in Trono of Cimabue, works by Vitale da Bologna, Lippo di Dalmasio, Angelo di Michele said Montorsoli, with the beautiful marble altarpiece on the high altar and other works of the bolognese school between 16th and 18th century. Music is one of the activities of the church with concerts, organized every year, and with the use of the organ situated on the left wall. Opposite the portico of the church rises the façade of Palazzo Davia Bargellini, with the statues of the two giants made by Gabriele Brunelli and Francesco Agnesini in 1658 with enormous blocks of sandstone coming from the bolognese Apennines.The palace is the seat of the Museo Davia Bargellini, a collection of paintings (la quadreria) belonged to an important bolognese family, and an exhibition of industrial art. Going on along strada Maggiore there is the princely Palazzo Hercolani, that can be visited on booking, while in via Fondazza, the last right side street before the porta and the viali (boulevards around the town centre), it is celebrated Giorgio Morandi’s art and life, the famous bolognese painter that lived (from 1910-1964) in this narrow street at the n. 36 till his death. His house called Casa Morandi is opened to the public after a plan of restoration by the Comune di Bologna. Near Piazzetta Morandi there is the chiesa di Santa Cristina, important both for its works of art and for its centre of listening to music with yearly program of concerts and international representations. © Copyright 2013 all rights reserved – Bologna ravegnana – It may not be reproduced in whole or in part.